Join our first AMA session on Thursday, September 21, 2017 from 9:00 AM-10:00 AM Pacific Time. Add the event to your calendar! Last month, we announced a new query language for Azure Log Analytics, offering advanced search and analytics capabilities, a straight-forward syntax, and a variety of new features. These features include joins, search-time calculated fields, rich date-time and string manipulation, machine-learning operators, and much more. We’ve also held a webinar, which reviewed the short upgrade process, and the new experiences we offer based on the new language. The Advanced Analytics playground: A free analytics environment that already includes demo data, and is open to anyone who wants to play around with the new language and portal. It also offers some basic examples to get started. The new language site: Everything you need to know about the new language - language references, cheat-sheets for users that are already familiar with SQL or the Log Analytics legacy language, videos, tutorials and guides for writing queries and using the Analytic portal, and lots of examples! An open git-hub repo for shared examples: You are invited to share your own examples with us! We will publish them on the language site as well. Finally - where real the action happens - our brand new community space: This is the place to post and answer questions, check out our announcement, and stay in touch. Today, we’re excited to invite you to a live AMA (Ask Microsoft Anything) session we'll hold on Thursday, September 21, 2017 from 9:00 AM-10:00 AM Pacific Time - an hour of live Q&A with the product team! This is your opportunity to ask us anything about the new language features, and our opportunity to hear what you want. 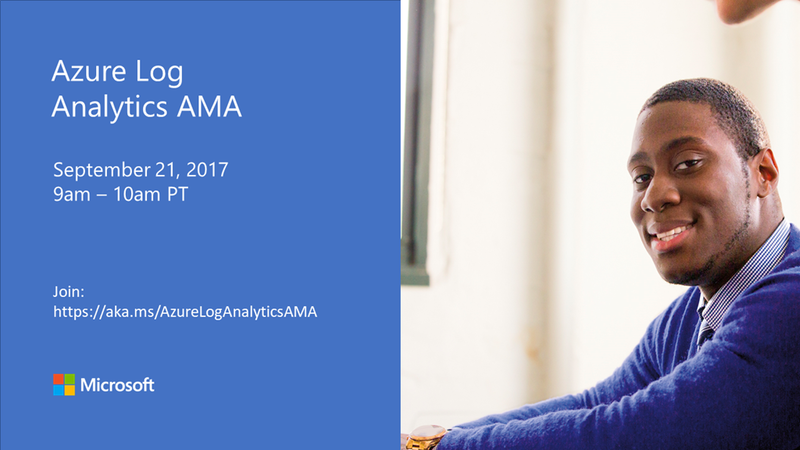 To join the AMA session, first join Microsoft Tech Community and familiarize yourself with the Azure Log Analytics space. The AMA session will take place in the Azure AMA space.